I would be lying if I said I didn’t have a sweet tooth. I have several. Actually, a mouthful. And I can’t help but eat handfuls of sweets at a time. Anytime. Like even morning time. Or nighttime. Or all the inbetween times. It’s kind of amazing that I’m not eating candy right now. I get gitty at the movies. I get a rush during the holidays. And I fall madly in love with anyone (friend or friendly bunny) that comes to my house bearing sour chews, licorice strips, chocolate covered anythings, and fluffy marshmallow treats. And last week, my wonderful sister-in-law did just that. The week before she brought me salt-free bacon (and she’s still working on perfecting the recipe for you all). And as if that wasn’t enough, this week she surprised me with homemade, low-sodium lemony Peeps. I can’t even imagine what next week has in store. It seems like with her, the possibilities are endless. We can’t all have sisters-in-law like this. She’s a rare gem of both love and talent. But what we can all have is her wonderful Peep recipe, adapted from the Smitten Kitchen, that she wants to share with all of you. Now, normal Peeps are not high in sodium, but they are sure high in junk. So in keeping with homemade, healthy treats, this is a nice alternative. Of course, if you want to go super natural, check out these tips for ways to color your food without any store-bought dyes from my good friend Kathy at Lunchboxbunch.com. And if you want to skip the gelatin, check out this vegan marshmallow recipe. You’ll need some specialty ingredients (soy protein powder) as well as sodium-free baking powder, but other than that, you can follow the directions below to make your little marshmallow bunnies free of animal products. 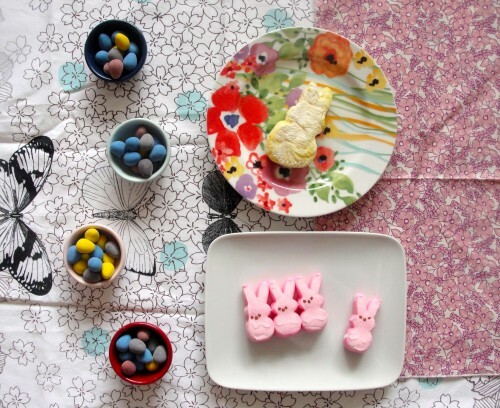 So celebrate Easter, spring, and your sweet tooth. And be sure to share these Peeps with some peeps you love. Prepare a 13 by 9 by 2-inch pan by covering with aluminum foil. Oil the foil (we like safflower or canola as they have little flavor) and lightly dust the bottom of the pan with some powdered sugar. Pour the ½ cup of very cold lemon juice into the bowl of an electric mixer (or in a large bowl, if using a hand-held mixer). Sprinkle the gelatin on top of that and let stand to soften. In a heavy, nonreactive saucepan cook granulated sugar, ½ cup + 2 tbsp of cold water, over low heat. Stir constantly until sugar is dissolved. Increase to medium heat to bring sugar mixture to a boil. Once boiling, let the mixture cook without stirring, until a digital thermometer registers 240°F. Pour sugar mixture over gelatin mixture, stirring until gelatin is dissolved. With an electric mixer, beat sugar, gelatin, and lemon juice mixture on high speed for approximately 6 minutes until it is white, thick, and nearly tripled in volume. In a separate bowl, with clean beaters, beat the egg whites until they hold stiff peaks. Add whites, lemon zest, and optional food coloring into sugar mixture and beat until just combined. Pour marshmallow fluff into prepared, foiled pan. Sift 2 to 4 tbsp of powdered sugar evenly over top. Refrigerate marshmallow, uncovered, until firm, at least three hours and up to one day. Using a bunny-shaped cookie cutter, cut out Peeps from marshmallow slab. 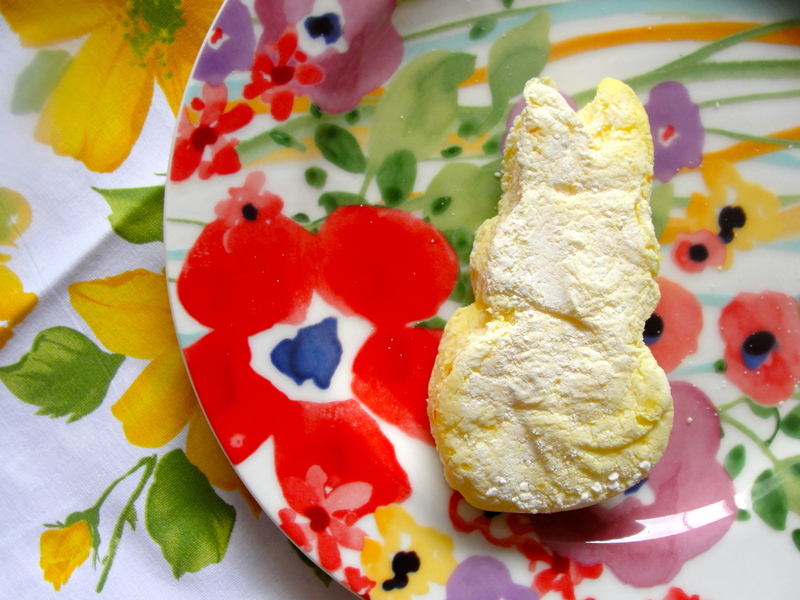 Roll each peep in powdered sugar. 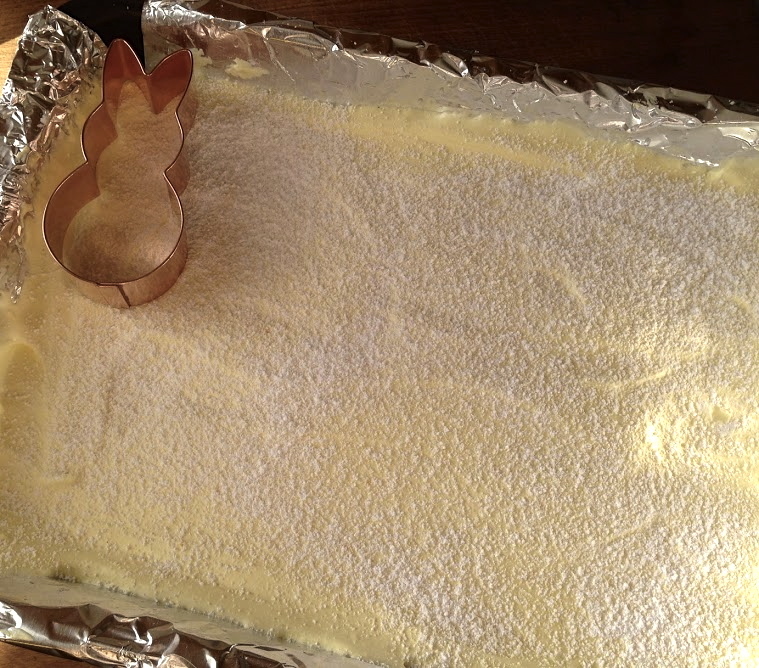 When all of the bunnies have been cut out, lift the aluminum foil tabs and remove the extra marshmallow trimmings from the pan. 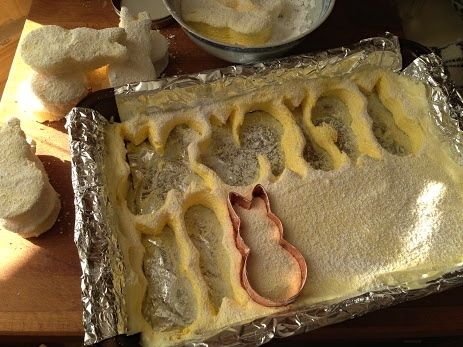 For a slightly more crisp outer layer on each peeps wipe out any oil from the pan, dust the bottom with more powdered sugar and place the bunnies back into the pan. Refrigerate, uncovered, for an additional 3 to 6 hours. Store peeps in an airtight container at cool room temperature or refrigerated for up to one week. + Sodium Count: 6mg per marshmallow. I love peeps! My grandmother sends me copious amounts of peeps at every holiday. Now I can make my own. 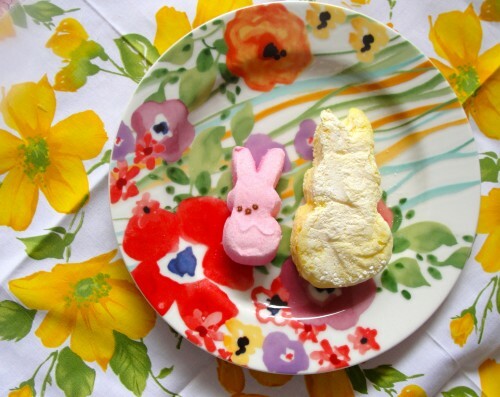 And my fav thing about this recipe, is that these peeps are GIANT peeps! I have a sweet tooth too. Thank you for this healthy recipe. I made this for tea time. I can’t believe I found this recipe the day AFTER Easter. At least I can take a year to practice! I bet the lemony flavor goes really well with the texture. I’m trying to work better, less processed foods into my diet after reading a book called Health on Your Plate, and I think this is a perfect treat to try with that philosophy. Thank you for sharing! 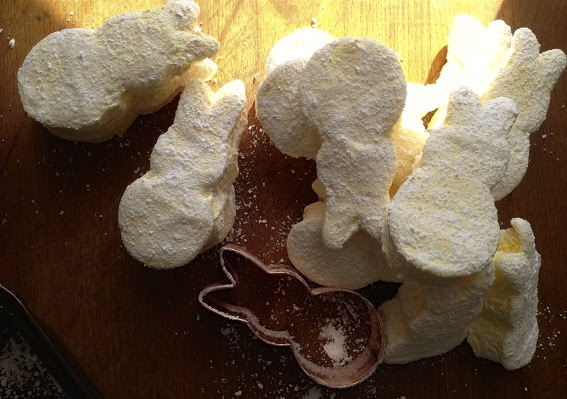 Who would have thought about salt-free marshmallow peeps? It’s a great Easter recipe, wish I’d seen it last week. Enjoyed the pictures, too. I have a friend that loves peeps and buys them for every occasion. I’m going to have to send this recipe for her…she’ll love it! I loved lemony bunny peeps. I had no idea to how to cook those marshmallows. Thank you for your informative post. I would try it soon and my kids would love it. Great little recipe. I’ve two young kids and I’m increasingly making my own home made recipes as I can’t trust packaged foods. Its coming up with ideas, especially healthier snacks for them that is my problem. That’s why I love your site. The sweats are looking so funny and nice. Kids would love them. I trained myself to eat less sugar. I drink tea without sugar and only eat something sweat once a day after a meal. It is not that difficult to get used to eating less sweats. These are adorable; such a cute idea. I miss you!! Sending you hugs from NYC. xoox Love u! These look awesome, but I’m not a fan of lemon. Maybe orange or lime would work instead? Definitely! Go for it. Explore. Honor thy palate. I have always loved anything lemon. Whenever I am in the mood to bake or when I go to bakeshops, I always tend to bake or buy the pastry with lemon in it. This is something that I can bake all the time. Thanks! What a fantastic recipe. I love to spend a Saturday morning with my kids in the kitchen teaching them about food so guess what we’re doing this weekend. This is a great recipe, certainly an improvement on the store-bought kind. What would you call a bunny shaped peep? A nibble?